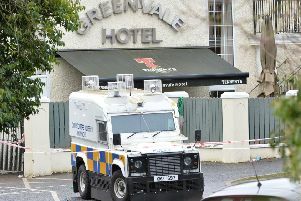 A Magherafelt man who “made a nuisance of himself” while trying to get into a casino premises in the town, was given a four-month jail sentence, suspended for three years, at the local Magistrates Court. David Semple, 42, of Leckagh Drive, admitted charges of indecent and disorderly behaviour at Church Street and Queen Street on August 12-13 last. District Judge Oonagh Mullan said defendant’s attitude towards police was not acceptable and she was giving him his last warning. The court heard that at 10.30pm on August 12 police at Church Street saw the defendant standing outside a food business urinating. A PPS lawyer said the street was busy at the time with pedestrians and police approached the defendant, who smelled strongly of intoxicating liquor. He told police: “I’m going to court for having a p***”. The barrister said defendant continued with his abusive behaviour at a hot food carryout when prevented by staff from entering. Pleading for leniency, a defence barrister admitted it as an “unsavoury” incident, but claimed the defendant’s character had changed. He added that Semple had too much alcohol taken on this occasion, and had made a nuisance of himself in front of people who were simply going about their business.